Wondershare PDF Creator for Mac is a great utility to create PDF documents. This versatile software can create top quality PDF documents from Microsoft Word, Excel and Powerpoint file types too. 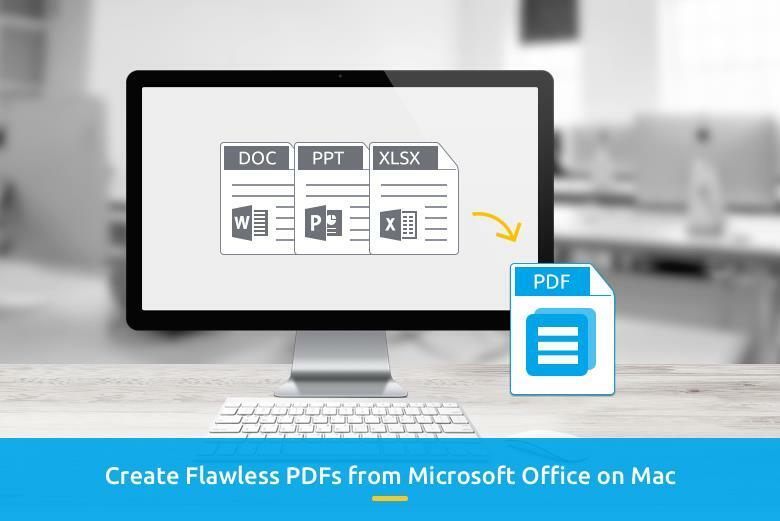 This software supports multiple PDF files from multiple Microsoft Office document formats simultaneously. 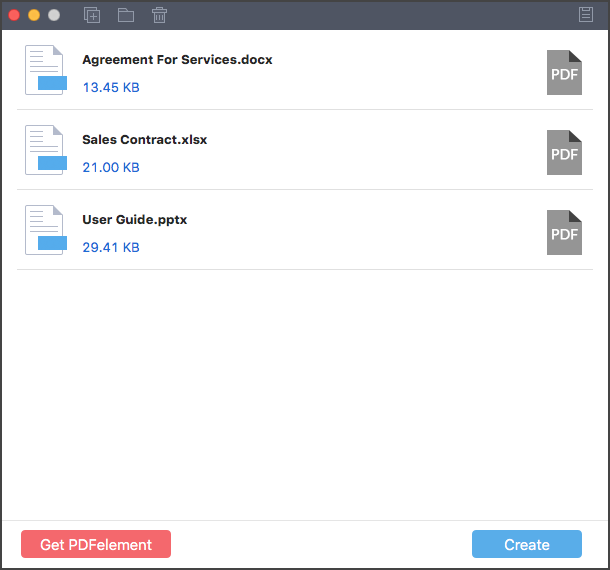 Read on to know more about PDF Creator for Mac in this article. Creating PDF files from other file types is something professionals come across very often but sometimes the platform to get the highest possible quality can pose some challenges. However, Wondershare PDF Creator for Mac is a simple but highly powerful tool that can be used to create PDF files from other file types like PowerPoint, Excel and Microsoft word. In fact, it is regarded as one of the smartest office to PDF converter for Mac. It boasts of awesome features required to get the best out of your PDF files. Check out the more details of PDF converter for Mac. First of all, this tool supports the creation of PDF files from a lot of formats especially Microsoft office platforms. For example, it is just easy to turn those excel sheets into a PDF file. Also, those presentations in PowerPoint and word documents can be converted to a PDF file. It is important to note that it can work for PPT, PPTX, DOC, DOCX etc. There is also an advantage of time savings when using the Wondershare PDF Creator for Mac. In fact, when compared to its competitors, this tool offers a much faster service that saves you a whole lot of time when doing a conversion. For example, one awesome feature it has is its ability to create multiple PDF files from multiple Microsoft documents simultaneously. In this case, you can achieve that by just adding entire folder of the office documents you intend to convert and get the conversion at the same time. The quality of output of the PDF creator for Mac is never in doubt. Wondershare PDF Creator for Mac is known to produce very top quality PDF files from these sources. One important thing to note is that these conversions are done is such a way that it retains the formatting source of these documents. In fact, there is even more to it because these PDF files created are the same with any other PDF files as they can work very well with any of the third party PDF readers, converters as well as Editors. This is so because the resolution of the created PDF maintains the ISO PDF standards. It is important to state that the best tools are those ones that are easy to use and Wondershare PDF Creator for Mac falls into this category. The user interface is straightforward, friendly and highly intuitive. It is very clear even for first time users and as long as you can use a mouse, you are just good to go with this tool. In fact, there is no need to start learning the software because it is not necessary. Finally, Wondershare PDF Creator for Mac is so powerful because it does not have any restriction on the number of files you can convert at any particular time. For example, you are not limited on the amount of files and that means you have the opportunity to import to the platform as many files you may like to convert. The truth is that this tool is great and it is sure that you will love it, just try it. Here's the quick tutorial on how we can turn On or Off the automatic login features on startup. Apple mac has an option to turn on or Off the automatically login on startup, this tutorial will guide you through steps for same. This article discusses about technical specification, features and price of Apple iMac 21.5 inch. What is the price of Apple iMac? Well, the Apple new iMac is totally different and more advanced than its previous versions. There are certain additions and deductions in hardware and software in this version of Mac. Let's learn more about this gadget in detail.